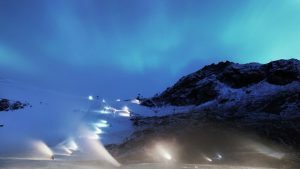 Soelden, Austria – The traditional World Cup season opening women’s and men’s giant slaloms are confirmed for next weekend on the Rettenbach Glacier in Soelden. The Audi FIS Ski World Cup opening got the green light to proceed during a snow inspection on Friday, thanks to efficient work from the local organizing committee. “The slope preparation is already so perfect, that we could race this weekend! It’s better than it has been in the past 10 years,” FIS Race Director Markus Mayr said on Friday. Together with Rupert Steger (OeSV), Rainer Gstrein (Chief of Race) and Isidor Grüner (Chief of Course), their decision was easy. Snowmaking was underway in full earnest, supplemented by some natural snowfall. Women have been cleared to race on Saturday, followed by the men on Sunday. The season opening will also launch this winter’s celebration of the 50th anniversary of the FIS Ski World Cup. Heinrich Messner, winner of the first World Cup race in Berechtesgaden, will be on hand to watch this weekend’s races. While the U.S. Ski Team has yet to confirm its start list for Soelden, neither Lindsey Vonn nor Julia Mancuso will enter the starting shack on Saturday. Vonn, a speed specialist, typically skips the technical events in Soelden and will continue her book tour in the U.S. Mancuso has only recently returned to gate training following hip surgery that kept her off the slopes all last season. World Cup racers from other nations will be missing their start in Soelden as well. Austrian star Anna Veith (née Fenninger) is still recovering from last year’s knee injury sustained while training in Soelden. German racer Viktoria Rebensberg has been sidelined by a leg broken while training on the Pitztal Glacier this fall. On the men’s side, Norwegian powerhouse Aksel Lund Svindal recently confirmed to the media that his knee injury from a crash during the famed annual Hahnenkamm downhill in Kitzbuehel is more serious than he’s been letting on. Super G World Champion Hannes Reichelt of Austria is out indefinitely following back surgery last month.